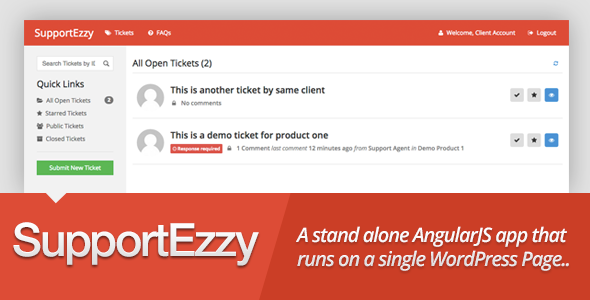 SupportEzzy is an elegant support tickets system and faqs portal for WordPress. This is a stand-alone AngularJS app which runs on a single WordPress page of your website. This app does not interfere with your existing theme and plugins and will work with any kind of WordPress website. You can use this App as a part of your existing website or create a new WordPress installation and run this app on a homepage. Built and run on AngularJS and uses WordPress as its backend. Clean, Modern and Premium quality design. Get rid of the monthly fees you pay for such premium services. Runs on a single WordPress page and does not interfere with existing setup. File uploads with ticket and comments. Support agents can be assigned different departments and products. Tickets are distributed randomly for load balancing to agents based on the department and product selected by the client while submitting the ticket. Agents can transfer tickets with internal notes to other departments. Agents can create FAQs from their comments on tickets for products. Customize all email messages sent to client, agent and admin via backend settings with dynamic variables. Customize color scheme based on your website colors. Manage if clients and agents can edit their comments. Display Sitewide content in left sidebar for client and agent based on thier role. On ticket page, users can see if the client has purchased the product or not. Import all your envato marketplace products. Customers must verify their purchase before creating new tickets. Products are synced automatically every week. Run the app via shortcode or PHP function, which means now you can call your WordPress Header, Footer or Sidebar based on your theme configuration. Very easy to install and setup. Practically you just need to select a page in plugin settings and its ready. Translation ready via .PO file.